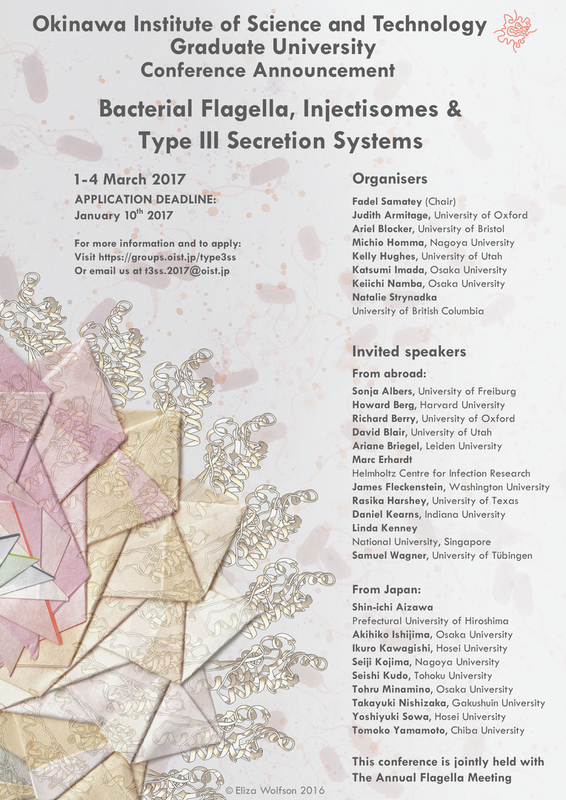 The OIST International Workshop on Bacterial Flagella, Injectisome and Type III Secretion System will be held at Okinawa Institute of Science and Technology Graduate University (OIST) in Okinawa on March 1 - 4, 2017. This will be held also as the Annual Flagella Meeting, which was started more that 20 years ago just as a local meeting but over the years we have invited many colleagues from abroad. Fadel Samatey at OIST planned to make the 22nd Annual Flagella Meeting as an International Workshop funded by OIST, and all scientists working on or interested in bacterial flagella, injectisome and type III secretion system are invited. The meeting will be organized in a manner similar to the GRC-STIM and BLAST meetings. We very much look forward to having you join us at the meeting. For decades, a group of researchers have tried to understand the functional mechanism of the bacterial flagellum and of virulence-associated type III secretion systems. The aim of this symposium is to bring together this community of researchers that works in different fields of science and using diverse techniques to answer questions that are closely related. This symposium will, with no doubt, create a new level of collaboration between the different laboratories and topics that will be of great benefit for graduates students, young researchers and professors. The flagellum is an organelle that enables Bacteria to swim in their living environment. It is widely distributed throughout the bacterial world. Flagella come in different sizes. Their length and diameter vary among species. They can be polar or peritrichous, and some species possess a sheathed flagellum. The first observation of a flagellum obtained by electron microscopy in the early 1940’s brought lots of excitement and questions on its structure and its functional mechanism. Gram-positive and Gram-negative bacteria have essentially identical flagella. The bacterial flagellum can be divided in three main parts: the filament, the hook and the basal body. A particular feature in the bacterial flagellum is the existence of a central channel running all through its length. Through this channel, the flagella axial proteins will be exported to assemble at the distal end and form the flagellum. The export of these proteins is directed by the flagella type III secretion system (T3SS). Many pathogenic Gram-negative bacteria also possess an appendage named the injectisome that is used for the secretion of virulence proteins into host cells. This secretion is done by a virulence T3SS that is homologous to the one found in the flagella system. The T3SS is present in both plant and animal pathogens and is evolutionarily related to the one found in the flagellum. Interestingly, bacterial flagella themselves can also be directly involved in virulence protein secretion and host cell adhesion. Understanding the functional mechanism of the T3SS in general has an importance in increasing the basic knowledge of the cell secretion systems. This will also help for the development of specific drugs against diseases originating from this type of secretion.